Wabasha County sees positive change unfold with a worksite tool introduced in 2018. The CDC Worksite Health ScoreCard is a tool designed to help employers assess whether they have implemented evidence-based health promotion interventions or strategies in their worksites to prevent heart disease, stroke and related conditions such as hypertension, diabetes and obesity. The ScoreCard provides guidance on key evidence-based strategies that employers can put in place to promote a healthy workforce, increase productivity, and reduce the risk and associated cost of poor employee health. Wabasha County completed the CDC ScoreCard in 2018 and again in 2019. Positive changes were seen and the scores were used to see where there continues to be room for improvement in employee access to healthy lifestyle changes, weight loss, heart health, increasing employee activity, and personal coaching. The assessment was useful for updating our action plan, for working with our wellness committee to identify which actions will move forward, and for delegating efforts. With the completion of a CDC ScoreCard and action planning, Wabasha County was able to receive SHIP funding for water bottle filling stations and enhancements to their exercise rooms. If you’d like to learn more about accessing the CDC ScoreCard tool and partnering with Wabasha County SHIP, email Tina Moen, SHIP Coordinator or call 651-565-5200. Find some of our partner resources here. Your organization is invited to join our Wabasha County Worksite Wellness Collaborative. Any size employer is welcome to join! Whether your organization has a wellness initiative in place or is new to the concept, we invite you to learn more and participate. Investing in the health of your employees is an important step for all employers to take. By creating a workplace wellness initiative, most of the best practice recommendations take little to no financial resources - only staff time to plan - but the benefits are many: increased productivity, improved morale and better managed health care costs. Organizations that have or are willing to develop the following characteristics are more likely to succeed in building a sustainable workplace wellness initiative. If you’d like to learn more about partnering with Wabasha County SHIP, email Tina Moen, SHIP Coordinator or call 651-565-5200. Find some of our partner resources here. Wellness Garden at Saint Elizabeth's Medical Center has a second year of success. The menus at Saint Elizabeth’s Medical Center and Health Care Center in Wabasha are bursting with flavor, brimming with color and teeming with freshness. A raised garden bed provides fresh herbs that go directly to patients and beyond. The garden began early in the year with construction of two raised beds by a team of volunteers at the hospital. It produced an array of fresh herbs and vegetables, and increased access to fresh foods for the hospital patients, staff and visitors. They also grew cherry tomatoes, radishes, lettuce and peppers to be used in soups, hot dishes and other dinner favorites. In 2017, there were more than 20,000 meals served using fresh garden produce and herbs, benefiting patients to nursing home residents to visitors to staff eating from the hospital café menu. The reach for such a project was fantastic - as was the feedback. “Our staff picked garden goodies in the morning and we served these items at lunch or dinner time. The taste of garden-fresh produce cannot be beat,” said Paula. Follow Saint Elizabeth's Medical Center's Wellness Garden progress on their Facebook page here. Wabasha County has received MDH designation as a Breastfeeding Friendly Workplace. Wabasha County values good health in its community members, including its youngest. That’s why in the fall of 2017, the Wabasha County Wellness Committee, in collaboration with Wabasha County SHIP and Maternal Child Health, decided it was important to support its breastfeeding mothers. One way to do this was to apply for a Breastfeeding Friendly Workplace designation through the Minnesota Department of Health. First step: A committee was formed to identify current and future breastfeeding areas, and it was determined there should be breastfeeding rooms available in the county courthouse, criminal justice building and the service building. Space was found in each building and the group received the necessary funds to provide the rooms with the furniture and supplies needed. The rooms are available to all county staff who are breastfeeding, and several have been using the rooms and comment on how clean and comfortable they are. They also appreciate the willingness of the county to go this extra mile so they can continue breastfeeding after they return to work. Next step: The committee reviewed the breast feeding policies used by Goodhue County and used that as a template to guide creation of a Breastfeeding Friendly policy. It took six months, but the county board of commissioners approved the policy and the changes and then the rooms were open for business. The Minnesota Department of Health and Wabasha County understand the importance of breastfeeding babies for the first year, if possible. Studies show breastfeeding is important to the health of babies and their moms, with lower rates of ear infections, colds and other ailments for babies. You can read more about the benefits of breastfeeding at the Minnesota Department of Health website here. During the summer of 2017, Fernbrook Family Center saw a need to provide its employees with healthy snack options, especially for those who travelled for work quite a bit. These staff members often travel with clients or to client homes resulting in eating schedules that are varied, limiting their options for snacks and lunch. Before, staff members would buy snacks from local gas stations that were familiar but not very healthy. Shaylma Salinas, Fernbook’s Community and Marketing Specialist, decided to apply for a multi-county SHIP grant to launch a Workplace Wellness initiative that included providing healthier food options and a dietician to provide a demonstration filled with tips and recipes. She hoped this presentation and sampling would help staff understand the benefits of healthier options, learn about new foods, and try some healthy snack options. The presentation was a success and staff appreciated the continuing education on healthy food options. Staff members also left with an incentive to continue making healthy choices. Partnering with the Owatonna Hy-Vee gas station as a pilot, Fernbrook employees now receive a 10-percent discount on snack purchases. 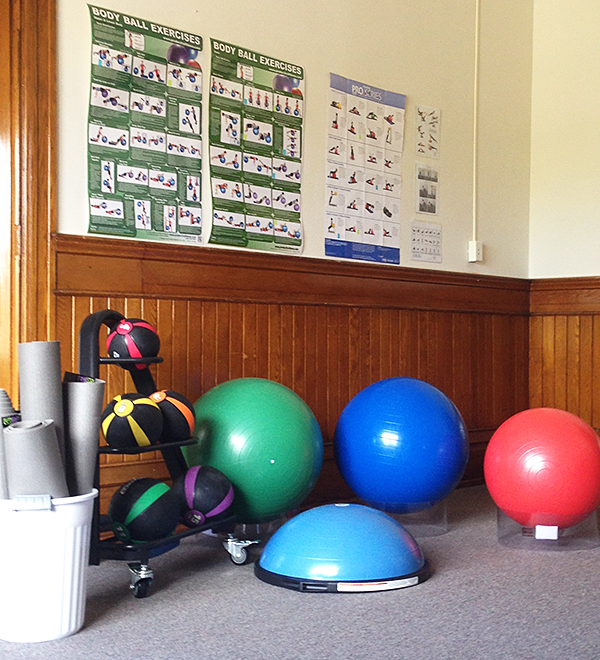 “I really like how you offer flexibility to our worksite wellness program. Having this opportunity helps with the sustainability of healthy change. Wellness can be seen as a low priority but through SHIP implementation, it’s helped spark change and new concepts are being practiced making it an easier sell for items which aren’t funded by SHIP. This work has helped to alleviate tension and improve workplace culture,” said Salinas. If you’d like to learn more about partnering with Wabasha County SHIP, contact Tina Moen, SHIP Coordinator, at tmoen@co.wabasha.mn.us or at 651-565-5200. New grant cycle for Wabasha County Worksite Wellness Collaborative. Our first quarterly meeting of this grant cycle was held on December 11, 2017. Our topic was healthy eating. Our guest speaker was Sara George, Wabasha Farmers Market Manager, who spoke to the group about Farmer's Market Shares or Community Supported Agriculture (CSA) and about a food aggregation pilot being trialed in Wabasha, Lake City, and Cannon Falls. CSA boxes were tested last year in Wabasha. Participating employers signed up in February of 2017. Wabasha County participated, said Tina Moen, SHIP Coordinator, and there was a nice assortment of product in the boxes which gave us the opportunity to eat healthy and many of us tried new foods. Sara is interested in sitting down with any member of the collaborative to talk about individual programs related to bringing in farm-fresh produce. Please contact her at wabashafm@gmail.com or 715-651-5046. Future topics for this grant cycle include Tobacco-Free Environments, Breastfeeding Support, and Physical Activity. Mini grant applications were due February 23, 2018. A second round will take place with a deadline to be announced. If you would like learn how to become a part of our collaborative and/or how to become eligible to apply for a grant, please email Tina Moen or call her at 651-565-5200. Healthy Eating at Saint Elizabeth’s Medical Center. The menus at Saint Elizabeth’s Medical Center and Health Care Center in Wabasha are bursting with flavor, brimming with color and teeming with freshness. A raised garden bed provides fresh herbs that go directly to patients, and beyond. It began early in the year with construction of two raised beds by a team of volunteers at the hospital. It produced an array of fresh herbs and vegetables, and increased access to fresh foods for the hospital patients, staff and visitors. “We selected herbs as our first focus,” explained Paula Thompson, registered dietitian and director of Nutrition Services. “Our goal was to reduce sodium in many of our dishes and replace salt with healthier options. Basil, parsley, thyme, cilantro, rosemary, sage, dill, and tarragon which offer interesting and tasty alternatives.” They also grew cherry tomatoes, radishes, lettuce, peppers to be used in soups, hot dishes and other dinner favorites. In 2017, there were more than 20,000 meals served using fresh produce and herbs from the garden, from patients to nursing home residents to visitors and staff ordering from the hospital café. The reach for such a project was fantastic, as was the feedback. “Our staff picked garden goodies in the morning and we served these items at lunch or dinner time. The taste of garden- fresh produce cannot be beat,” said Paula. Saint Elizabeth’s Wellness Garden was so successful that committee members are looking to apply for SHIP funds next year to expand the gardens and its bounty for all to enjoy. Saint Elizabeth’s Wellness Garden was so successful that committee members applied for SHIP funds in 2018; read more about this success in the Minnesota Newspaper Associations 2018 Daily Newspaper by following the link here. Raised garden beds now at Saint Elizabeth Medical Center. Raised gardens have now been constructed and are on campus for growing herbs to be used in Saint Elizabeth’s dietary kitchens. Raised garden beds will also contain potted plants and be placed at various campus locations. Efforts to promote healthy eating among associates, patients, residents, tenants and guests will continue to be a priority of the Saint Elizabeth’s Wellness Committee. Staff training will include growing, harvesting and cooking. Fresh, savory herbs grown onsite will substitute sodium used in many menu items. This project has been funded by Wabasha County SHIP. Lactation suites open at Saint Elizabeth’s. In April, Saint Elizabeth Medical Center held a grand opening tour featuring for their lactation suites in the Medical Center and Health Care Center. With funding support from Wabasha County SHIP, the suites provide nursing mothers a convenient, private, sanitary and comfortable space to express, collect and store breast milk. Six partners from the previous round of SHIP have resumed with SHIP Worksite Wellness efforts, and one new recruit has joined with a total of 22 sites and a potential to reach 1,022 employees. A survey was conducted to determine the order of coalition priorities and the topic of the quarterly meetings. Topics include policy, systems, environment (PSE); stress management; physical activity, healthy eating; tobacco-free environments; and breast-feeding support.